From the Boardwalks of Coney Island These Antique Styled Popcorn Machines will Remind you of an era when Vendors sold Popcorn on Street Corners all across America. Industry Longest Three Year Parts Warranty. From the Boardwalks of Coney Island These Antique Styled Popcorn Machines and TWO-Wheeled Red Carts will Remind you of an era when Vendors sold Popcorn on Street Corners all across America. Your choice of a 4 or 6 Ounce Popping Kettle. 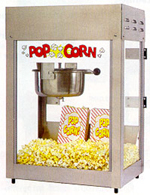 The Metropolitan Was Created for The Home Theatre. 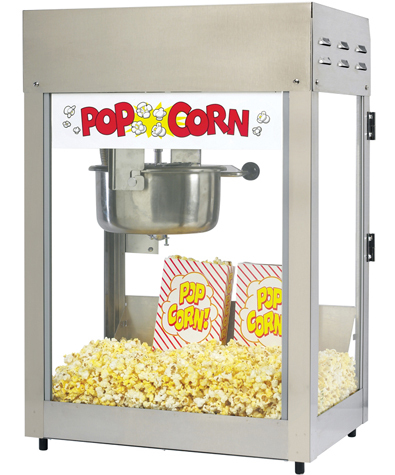 This is our Only Front Serving Popper. The Doors Open from the Front!!! 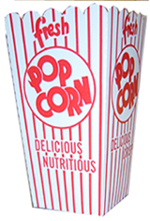 This Popper can be placed Against a Wall. 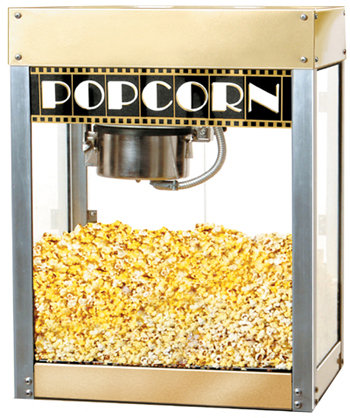 Features an anodized kettle, heated deck, tempered glass, and metal POPCORN crown sign. PROFESSIONAL and CONTEMPORARY POPPER AND BASE!! This Popper and Base can be placed Against a Wall. 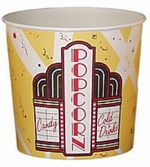 black powder-coated Base with attractive Popcorn Deco Design appliqué. 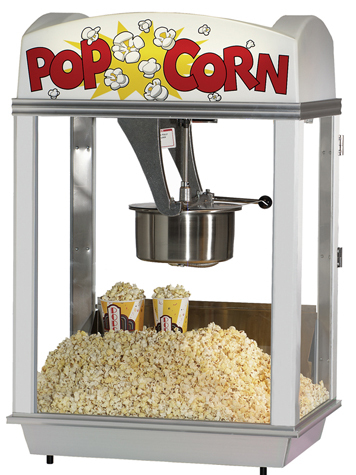 Every Movie Theatre Serves Fresh, Delicious Popcorn. 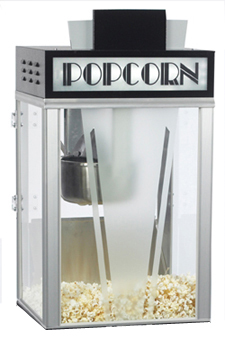 The TITAN 6 ounce is the Perfect Popper When a Smaller Size Cabinet is required. All Steel Cabinet, With Removable Window Glass. Easy To Clean Stainless Steel Kettle. 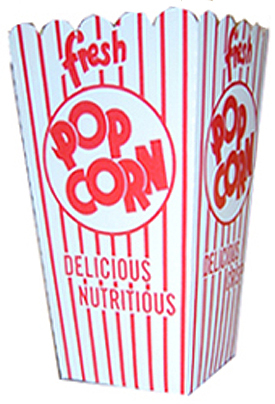 Heated Deck Keeps Popped Corn Warm. 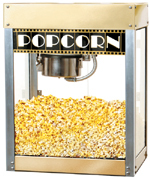 The Aroma Of Fresh, Delicious Popcorn Will Fill Your Theatre. Stainless Steel Kettle Cooking Surface Bonded To Aluminum Makes It Easy To Clean. 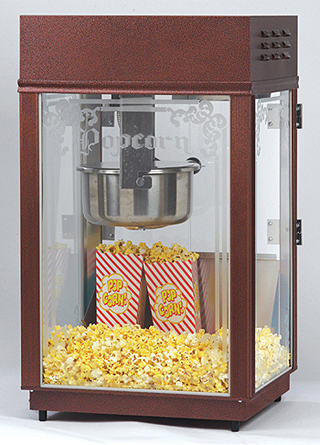 A Classic Popper With Bright Anodized Corner Posts and Red Dome. 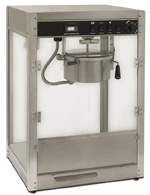 --E-Z Kleen removable twin arm kettle. 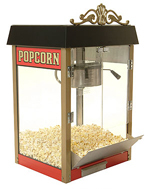 --Theatrical popper design with red metal dome. Your choice of a 4 or 6 Ounce anodized non-stick Kettle. 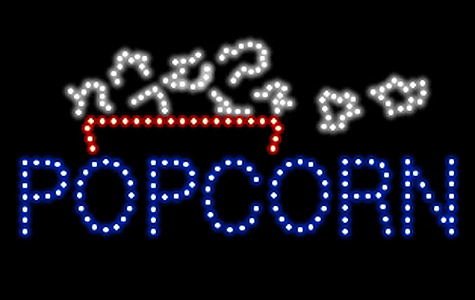 Popcorn Sign on the Popper. 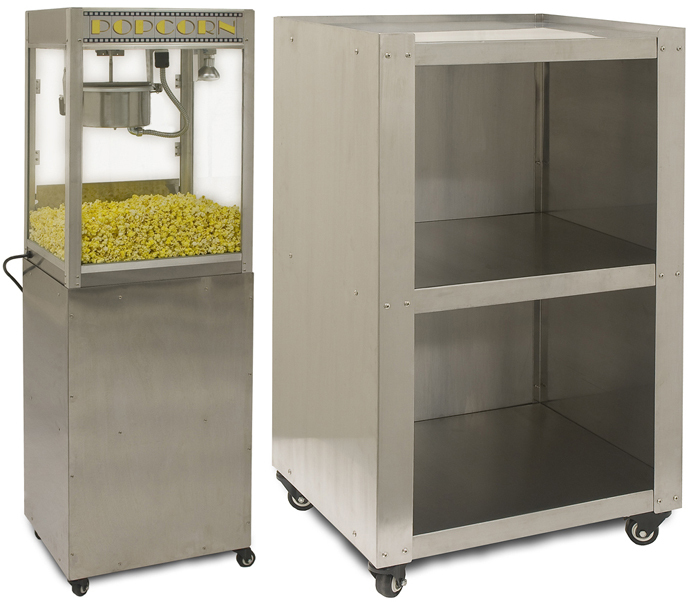 The Base has a two shelf storage compartment for all your popcorn supplies. PROFESSIONAL---Etched Glass gives this 6 ounce popper a distinctive ROYAL Touch. Beautiful Bronze-Toned Cabinet with a Simulated Woodgrain Dome. 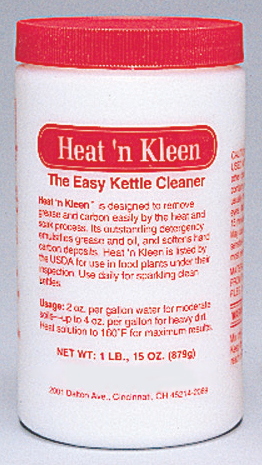 Easy Clean Stainless Professional Kettle. 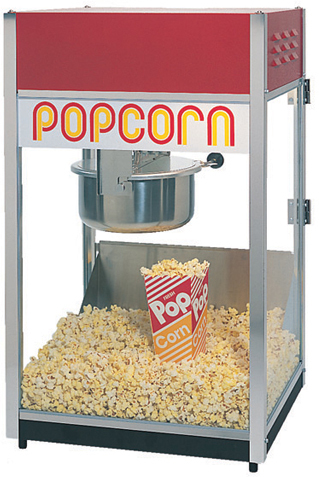 PROFESSIONAL 8 OUNCE KETTLE POPCORN MACHINE. 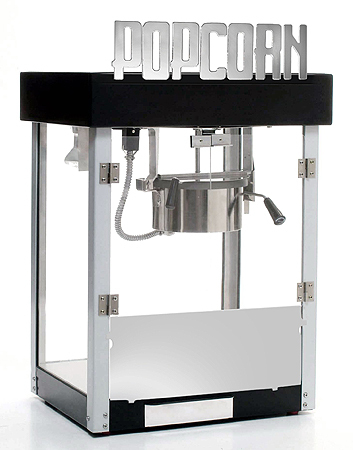 PROFESSIONAL 8 OUNCE POPCORN MACHINE WITH STAINLESS STEEL CABINET BASE. Distinctive Black and Silver Art Deco Designed Popper. 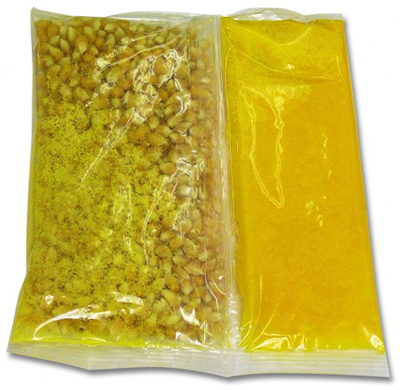 Exclusive 6 oz. 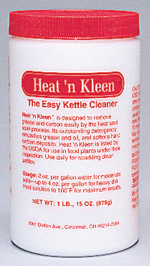 Easy To Clean Kettle. 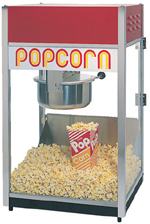 The Heated Chamber Bottom Keeps Your Popcorn Warm. Heavy Duty All Welded Frame Construction. 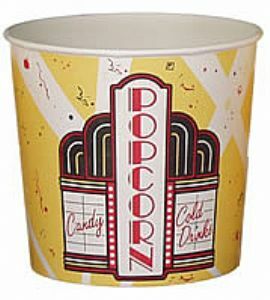 Lighted Popcorn Sign at Top. 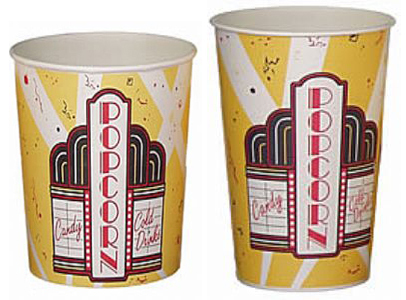 Distinctive Black and Silver Art Deco Designed Popper and Silk Screened Art Deco Black Base. 18in. x 16in. x 64in. This is the ORIGINAL SHOWPIECE of all Deluxe Poppers! Beautifully crafted, etched glass surrounds this elegant, classic machine. Two cast ornamental filigrees stately tower over the antique, brass finish. 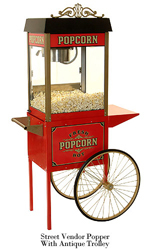 The Antique Popper rests upon the rugged, Metal Red Cart with real Rubber Tires and Golden Spokes. 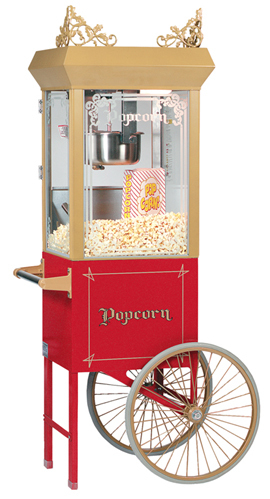 Equipped with a big 6-Ounce kettle for popping mountains of theatre corn for your guests. 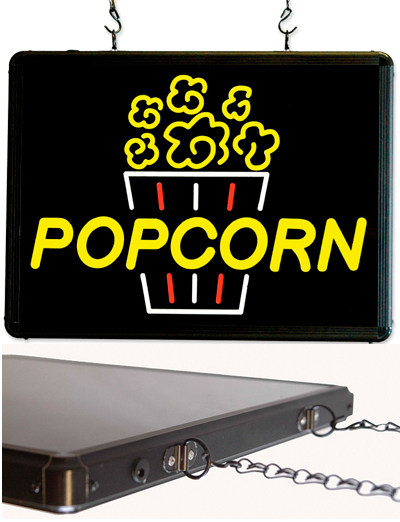 A handsome addition to your home theatre. 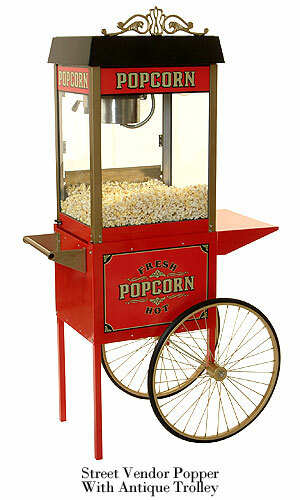 18" x 26" x 68"
VINTAGE APPEARANCE, GREAT TASTING POPCORN, THE ORIGINAL!!! 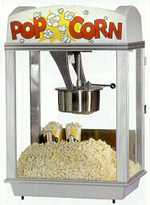 THIS IS THE LEGENDARY POPPER! 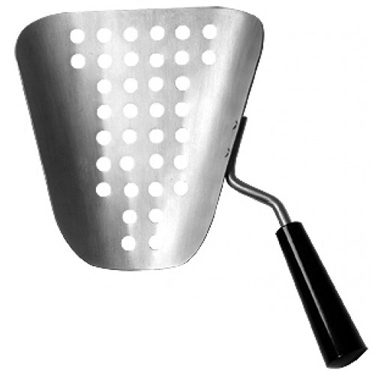 BIG 8 OUNCE, removable, easy to clean kettle. 20 in. x 28 in. 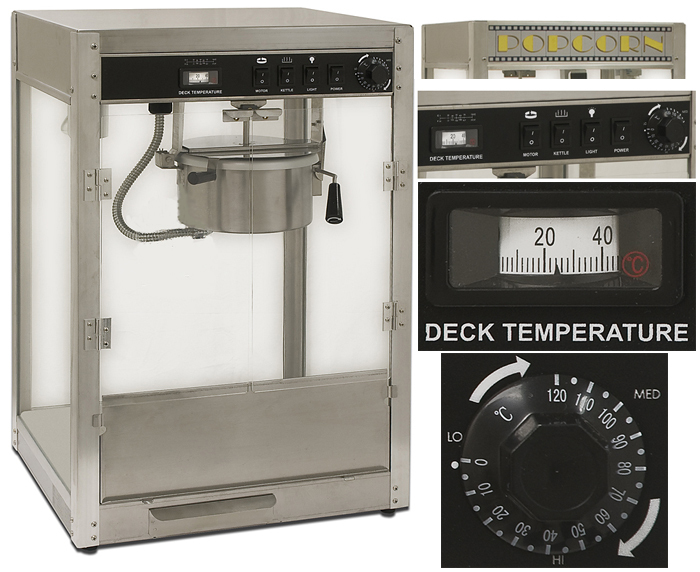 large internal warming cabinet. 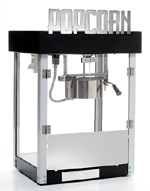 Easiest machine to operate and keep clean! 28 W x 21 D x 40 H.
THE WORLD FAMOUS 8 OUNCE POPPER!